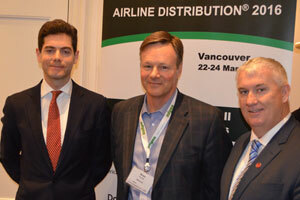 A cross section of airline executives from such carriers as Air Canada, WestJet and Cathay Pacific Airways recently took part in a panel discussion at the Airline Distribution conference in Vancouver – giving them the opportunity to review issues of airline fare distribution and other priorities in the industry. For instance, Duncan Bureau, VP of global sales at Air Canada, broached some of the core issues now shaping alternative distribution channels for airlines. Brad Turner, director of sales and distribution for WestJet, assessed the double-edged sword that is manifest by the lower exchange rate on Canadian currency, and by reductions in the price of oil. “More travel to Canada is the upside and we are looking forward to a strong summer of leisure traffic from the US,” he said. As for oil prices: “No airline is immune to the downturn on the Prairies,” he said. For the airline, that means a necessary redistribution of WestJet assets to better opportunities, for instance in the US, eastern Canada and Europe, he said. Nick Hays, VP Canada for Cathay Pacific, brought his perspective to the currency situation, noting that flights outbound from Canada are impacted by the weaker dollar, but that there is also some compensation as Canada became a more attractive destination for inbound travellers. “We hedge for these fluctuations, we roll with the punches,” he said. Pictured at the conference are (l-r) Hays, Turner and Bureau.